Need help on writing an essay about "Mahatma Gandhi"? Here is an sample essay on great leader and "Father of the Nation: Mahatma Gandhi". In this article you will find information about Gandhiji, his life, education and his various movements for India's freedom. Students can also refer to this article for preparing speech for Gandhi Jayanti. 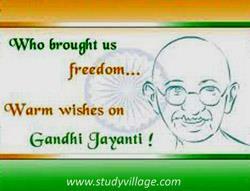 Mahatma Gandhi is called as the father of the nation. His full name was Mohandas Karamchand Gandhi. He was born on 2nd October, 1969 in a town called Porbandar, Gujarat. His father worked as a Diwan in a zamindari state. He was the architect of India's freedom. Mahatma Gandhi's life was dedicated to the ideals of truth, non – violence and love. Young Gandhi was a shy, average type of student. He completed his primary education up to the seventh year at Parbandar. Then his education continued at Rajkot. After completing his Matriculation examination, he went to England for higher study. As he was only nineteen years old, he wanted to become a barrister. He obtained the degree of Barrister-at-law and returned to India as a lawyer. In 1893, he went to South Africa to solve certain problem faced by the Indians living there, due to oppression and suppression of the British rulers. He worked a lot to improve the condition of Indian people. Gandhi became the leader of the South African Indian community. He introduced non- violent non-cooperation movement which was truly successful, and then no Indians were oppressed by the Government. After few years, Gandhi returned to India and joined Indian National Congress to make India free from British rules. He applied the same policy of Satyagraha, non-violent non-cooperation movement. In literal meaning, "Satyagraha" means insisting and demanding for truth and law. Gandhi knew that the Indians were not equipped with weapons to fight the mighty British rulers. So he asked his country men to boycott British goods and use swadeshi (Made in India) goods. He himself did the same as he used wooden spinning wheel for making rough cotton khadi for himself. Million of Indians followed him and started preparing clothes for themselves. Khadi became the national dress of the Congress workers, and the wheel became the symbol of Indian national flag. Gandhi marched out of his ashram with his follower to Dandi on the bank of Indian Oceans, and made salt from sea water. As making of salt was not allowed because of that many of the Indian were beaten and put them under the bar. Gandhi too went to jail several times as he fought for Indian's independence. This 5 times Noble award winner Indian, Mr.Mohandas Karamchand Gandhi was a true son of Mother India. Truth and nonviolence were his two great weapons. As a result of several life-sacrifices and movements of Gandhiji and several more freedom-fighters, India won freedom on 15th August, 1947. On 30th January, 1948 Gandhi was assassinated by Nathuram Godse, the editor of Hindu Rashtra news paper. Today Gandhiji is no more with us but his life and philosophy will continue to guide the people all over the India and across the world for years to come. This is a great resource about the father of the nation India in brief. I loved this because it is well explanatory and the life of this great man was really challenging as he fought for the unity of all Indians. Gandhiji was considered a national leader by the Nobel award committee in those days. So Gandhiji was never awarded the Nobel Prize. Kindly correct that part.